Prices of production (or "production prices"; in German Produktionspreise) is a concept in Karl Marx's critique of political economy, defined as "cost-price + average profit". A production price can be thought of as a type of supply price for products; it refers to the price levels at which newly produced goods and services would have to be sold by the producers, in order to reach a normal, average profit rate on the capital invested to produce the products (not the same as the profit on the turnover). The importance of these price levels is, that a lot of other prices are based on them, or derived from them: in Marx's theory, they determine the cost structure of capitalist production. The market prices of products normally oscillate around their production prices, while production prices themselves oscillate around product-values (the average current replacement cost in labour-time required to make each type of product). This understanding already existed in classical political economy (the idea of market prices which gravitate to "natural prices" or "natural price levels") but, according to Marx, the political economists could not really explain adequately how production prices were formed, or how they could regulate the trade in commodities. In addition, the political economists could not theoretically reconcile their labour theory of value with value/price deviations, unequal profit/wage ratios and unequal capital compositions. Consequently, the labour theory of value of the political economists was more in the nature of a metaphysical belief, than a scientific proposition. 6.2 What is the transformation? The concept of production prices is introduced and elaborated systematically in chapter 9 et seq. of the third volume of Das Kapital, although it is already referred to in earlier texts by Marx. The first significant discussion occurs in the Grundrisse (1857-1858), followed by numerous references in Theories of Surplus Value (1862-1863), letters by Marx to Engels of 2 August 1862 and 30 April 1868 outlining his theory, the Resultate manuscript (1863-1866), Capital, Volume I (1867) and Capital, Volume II (1865-1877). In Capital, Volume III, Marx considers the operation of capitalist production as the unity of a production process and a circulation process involving commodities, money, and capital. Capitalist production cannot exist without market sales, and therefore it is a type of production that fully depends on market trade. For the purpose of the analysis of the immediate process of capitalist production, which is the main subject of Capital, Volume I, successful market transactions are assumed and market fluctuations are initially mostly disregarded - but that gives only one half of the story. The products have to be sold at a profit, and purchased at a competitive price, through market trade and the circulation of capital. The argument in Capital, Volume III (Marx intended to publish still more volumes, but did not manage to do so) is that the sales of newly produced commodities in the capitalist mode of production are regulated by their production prices. What products will sell for, has to do with what it normally costs to make them, plus the profit mark-up that will secure a normal average return on capital for the producing enterprise. For efficient producers, there will normally be a larger margin between their costs and their sales-revenue (more profit), and for less efficient producers, there will be a smaller margin between their costs and revenue (less profit). Marx's controversial claim is that the magnitude of the production prices for products is determined ultimately by their current replacement costs in average labour time, i.e. by the value of products. A lot of the academic debate about Marx's concept of production prices is probably caused by the fact that Marx never finalized the text of the third volume of Capital for publication, although he drafted it before publishing the first volume. The book was edited together posthumously by Friedrich Engels, who tried to make a polished story out of a mass of draft manuscripts Marx left behind. Marx sketched complicated issues in a shorthand way which is sometimes ambiguous and incomplete, and does not make all the implications explicit. According to the German Marxian scholar Michael Heinrich, "Marx was nowhere near solving all of the conceptual problems". However, Marx's concept is also frequently confused with similar concepts in other economic theories. For most economists, the concept of production prices corresponds roughly to Adam Smith's concept of "natural prices" and the modern neoclassical concept of long-term competitive equilibrium prices under constant returns to scale. Nevertheless, the function of prices of production within Marx's theory differs from both classical political economy and neoclassical economics. A production price for outputs in Marx's sense always has two main components: the cost-price of producing the outputs (including the costs of materials, equipment, operating expenses, and labour) and a gross profit margin (the additional value realized in excess of the cost-price, when goods are sold, which Marx calls surplus value). Marx's argument is that price-levels for products are determined by input cost-prices, turnovers and average profit rates on output, which are in turn determined principally by aggregate labour-costs, the rate of surplus value and the growth rate of final demand. These price levels determine how much of the new output value that is created in excess of its cost price can actually be realized by enterprises as their gross profit. The suggestion is, that the differences among most producers with regard to their profit rates on capital invested will tend to "level out" as a result of business competition, so that a general norm emerges for the profitability of industries. In capitalist production, a basic profit impost is the normal precondition for the supply of goods and services. When competition for product markets intensifies, the producers' margin between cost prices and sale prices, their true income, shrinks. In that case, the producers can only maintain their profits, either by reducing their costs and improving productivity, or by capturing a bigger market share and selling more product in less time, or both (the only other option they can try is product differentiation). In a well-established product-market, however, the fluctuations in supply and demand are usually not very large. This basic market logic was already well known by medieval merchant capitalists long before the dawn of the modern era in the 15th century. Medieval merchant houses could certainly estimate their own rate of surplus value and profit rate (the amount of (surplus-)labour required to yield a certain financial result or valorization) but they usually did not have so much knowledge about socially average profit rates; few relevant data or statistics were publicly available and a "general rate of profit" might not exist anyhow, for lack of an integrated national market for products and capital, and given the limited scope of industrialization. The regulating price of a given type of product is a sort of modal average price level, above or below which people would be much less likely to trade the product. If the price is too high, buyers cannot afford to buy it, or try to get cheaper alternatives. If the price is too low, sellers cannot cover their costs and make a profit. So normally there is a limited range of prices within which the product can be traded, with upper and lower bounds. The production price then refers basically to the "normal or dominant price level" for a type of product that prevails during a longer interval of time. It presupposes that both the inputs and the outputs of production are priced goods and services—that is, that production is fully integrated in fairly sophisticated market relations enabling a sum of capital invested into it to be transformed into a larger sum of capital. In pre-capitalist economies, this was not the case; many inputs and outputs of production were not priced. Marx's claim is that the production prices of products themselves are fundamentally determined by the comparative labour requirements of those products, and therefore are constrained by the law of value. Since, however, not all goods are produced or reproducible goods, not all goods have production prices. A production price in Marx's sense can exist only in markets developed sufficiently for a "normal" rate of profit on production capital invested to become the ruling average for a group of producers. Substantively, Marx argues that the prices of new products sold will, assuming free competition for an open market, tend to settle at an average level that enables at least a "normal" rate of profit on the capital invested to produce them, and, as a corollary, that if such a socially average rate of profit cannot be reached, it is much less likely that the products will be produced at all (because of comparatively unfavourable profitability conditions). Marx defines the "general rate of profit" as the (weighted) average of all the average profit rates in different branches of production - it is a "grand average" profit rate on production capital. The simplest indicator of this rate is obtained by dividing total surplus value by total production capital employed. According to Marx's theory, investment capital is likely to shift out of production activities where the rate of profit is low and toward activities where profitability is higher; the "leading" sectors of industry are those where profitability is highest (today, these are in the production of computer facilities & hi-tech, healthcare, oil products and finance which serve the richer strata of the world population). The precondition is the free mobility of capital and labour, and thus there is a systemic tendency to remove all obstacles preventing investors from investing in sectors where profits are higher. If, for any reason, the free movement of capital is blocked or restricted, large differences in the profit rates of enterprises are likely to occur. In general, the trajectory of capitalist development is determined by the industries where the profits are the best, because their products are in high demand, because of special production or market advantages, etc. According to Marx, the movements of different production prices relative to one another importantly affect how the total "cake" of new surplus value produced is distributed as profit among competing capitalist enterprises. They are the basis of the competitive position of the producers, since they fundamentally determine profit yields relative to costs. Some writers argue that Marx's production price is similar, or performs the same theoretical function, as the "natural prices" of classical political economy found, for example, in the writings of Adam Smith and David Ricardo (though the concept of natural prices is much older). This is the orthodox Marxist view, based on quotations where Marx says that his concept of production prices recalls the classical idea of natural prices. In this case, Marx's production price would be essentially a "centre of gravity" around which prices for outputs in a competitive market will fluctuate in the long run (cf. Fred Moseley's view). This is an interpretation within the framework of equilibrium economics, which suggests that production prices are really a kind of "equilibrium prices". It can be supported with some textual evidence, insofar as Marx sometimes defines the production price as the price that would apply if the supply and demand for products were balanced. At other times, he refers to a "long-term average price" or a "regulating price". He does not say precisely how these three different concepts are related. The main objection against equating production prices with natural prices is that Marx's concept of production prices is precisely a critique of the "natural prices". Support for this interpretation can be found in Capital, Volume I, where Marx criticizes and ridicules the concept of a "natural price of labour" - this concept, he argues, rests on confusions of several different economic categories. Similarly, in Capital, Volume III, Marx rejects the concept of a "natural" interest rate, arguing that what this really refers to is just the interest rate that results out of free competition. According to this argument, there is actually nothing "natural" about the allegedly "natural" prices - they are socially determined effects of capitalist production and trade. More importantly, the existence of production prices does not logically depend on, or presuppose, an equilibrium state. If the classical economists talked about the "naturalness" of price-levels, this was ultimately a theoretical apologism; they could not reconcile their labour theory of value with the theory of the distribution of capital. They assumed a market balance, without proving how it could exist. The general theory behind the concept of natural prices was that the free play of markets would, through successive adjustments in the trading process, "naturally" converge on price levels at which sellers could cover their costs and make a normal profit, while buyers could afford to buy products; with the effect, that relative labour requirements would be genuinely proportional to relative prices. Yet classical political economy provided no credible theory of how this process could actually occur. Since it confused and conflated the value of labour power with the price of labour, commodity values with their production prices, and surplus value with profit, i.e. because it mixed up values and prices, it could in the end explain the normal price levels of commodities only as "natural" phenomena. In the sphere of capitalist production, Marx argues, commodity values are directly observable only as prices of production for outputs, established jointly by average input costs and by the ruling profit margins applying to outputs sold. It is a result of the establishment of regular, developed market trade; the production price averages reflect the fact that production has become totally integrated into the circuits of commodity trade, in which capital accumulation has become the dominant motive. What prices of production simultaneously hide, he argues, is the social nature of the valorization process—that is, how exactly an increase in capital value has occurred through production. The direct connection between labour time and value, still visible in simple commodity production, is largely effaced; only cost prices and sale prices remain, and it seems that any of the factors of production (which Marx calls the "Holy Trinity" of capitalism) can contribute new value to output, paving the way for the concept of the production function. the private or enterprise production price which forms the starting-point of the analysis in the first chapter. This price equals the cost-price and normal profit on production capital invested which applies to the new output of a specific enterprise when this output is sold by the enterprise (the "individual production price"). The rate of profit involved in this production price can be compared to the average rate of profit that obtains for a sector or nationally. the sectoral production price. This price equals the cost-price and average profit rate on production capital invested which applies to the output of a commodity produced by a specific industry, sector or branch of production (at "producer's prices"). This is the production price which applies for a particular type or class of product, reflecting the average return the producers can normally expect to obtain in the given sector. In his discussion of ground rent, Marx notes especially the differences between industrial and agricultural production prices. The suggestion is that there is a structural difference between the average profit rates applying to different sectors of production. the inter-sectoral production price. This price-level refers to the sale of output at producers' prices which reflect an average profit rate on a quantity of capital invested that applies to various sectors of industry. This is the fully formed industrial production price which Marx most often has in mind in his theoretical discussions of the equalisation process of profit rates; it reflects the producer's product-price at which the average rate of profit on production capital applying to a whole economic community is obtained (for example, a net return of 10%). the so-called real price of production, which Marx himself defines as the price of production for the commodity produced and sold by an industry plus commercial profit on re-selling the commodity (warehousing, distribution and retailing etc.). the so-called market production price. "This production price... is determined not by the individual cost price of any one industrialist producing by himself, but rather by the price that the commodity costs on average under the average conditions for capital in that whole sphere of production. It is in fact the market price of production; the average market price as distinct from its oscillations." This is roughly the same as what we would nowadays call the "average unit cost" of a product. the economic production price. This price, a total cost-price (i.e. a replacement cost) equals the average cost price and average profit rate of an output at the point of sale to the final consumer, including all costs incurred by all the different enterprises participating in its production (factory, storage, transport, packaging etc. ), plus tax imposts, insurance levies, incidental costs etc. In modern times, "costing" production in order to establish the expected yield on capital invested in it often involves assessing the whole value chain relative to the price level at which products can be sold to the final consumer. The question then is, how can the whole production of a product - from the factory gate to the final consumer - be organized so that it can sell to the final consumer at a price that the market will bear - and still make a good profit? Marx sometimes implies an "economic production price" when, for the sake of argument, he simply abstracts from everything that happens between the factory gate and the final consumer of a commodity. These different prices are revealed when we study the composition of the cost structure of a product at different stages of its production and supply. One source of interpretive difficulty is that Marx often assumes in his shorthand drafts that these six kinds of prices all refer to the same thing. But that is true only in the special case where one enterprise sells directly to the final consumer. The reason for this conflation is probably that Marx's real analytical concern was not really with the pricing processes as such, but with the main factors influencing the realisation and distribution of new surplus-value produced, when sales occur. After all, his argument was that competition in capitalism revolves around the quest of obtaining maximum surplus-value from production in the form of generic profit income (profit, interest, rent). The question was: how does a sum of capital invested in production get transformed into a larger sum of capital? What are the dynamics and overall results of that process? What are the implications for the process of economic reproduction? The existence of different types of production prices implies a much more complex picture than Marx initially provides in his discussion of the leveling out of profit rates through price competition. Thus, for example, in his discussion of ground rent, Marx claims that farm products can be persistently sold for more than their price of production, but below their value, while many manufactured products obtain their price of production only because they are sold for more than their value. In Marx's more developed theory of the circulation of commodities, the values of products, their prices of production and their market prices are all semi-autonomous variables which can both diverge and converge, through constant market fluctuations, affecting the profitability of enterprises. Nevertheless, Marx claims they will mostly tend to converge in the long term. the value of output created, equals the sum of capital advanced plus surplus value. the sum of input costs incurred in producing output (the cost price) is equal to the production capital advanced. fixed capital advanced is equal to fixed capital consumed, i.e. there is no depreciation of fixed capital. All output is sold at once, there is no problem with selling anything. There are no variations in the turnover of capital. The rate of surplus value is always uniform across all sectors. The rate of profit on production capital is uniform across all sectors. There are no obstructions to the free movement of labor and capital. Most probably the reason was that his real interest was in the overall dynamics of capital accumulation, competition, and the realisation of surplus value produced, assuming output would sell. He was thinking of grand averages and overall results. The simplified picture does not obtain in reality, among other things because, as Marx himself notes, capitalist competition turns on buying commodities below their value and selling them above their value (or, in the ideal competitive situation, to sell them below their value at a good profit, with a high turnover). Marx's theory is frequently confused with input-output economics and the marginalist theory of capital, in which total inputs and total outputs are always exactly equal in value, an equality accomplished by treating the factor income which is gross profit as an input, so that profit is both a cost and a revenue at the same time. Marx did not talk about inputs and outputs in this double-entry bookkeeping sense, where the source of funds balances against the use of funds; instead, he was concerned with how a sum of capital was transformed into a larger sum of capital through a net addition of new value created by workers in production. He was not really talking about quantities of input commodities and quantities of output commodities, but about quantities of capital required for commodity production and quantities of capital created by commodity production. If indeed the value of commodities bought was exactly equal to the value of commodities sold, capitalists would not even invest in production, because they would get no profit out of it. Their income would be offset exactly by their costs, yielding a zero net gain. So from Marx's point of view, input-output economics really mystified the "capital-relationship", i.e. the ability of the bourgeoisie to capitalize on the surplus labour of the workforce in virtue of its ownership of the means of production (in chapter 48 of Capital, Volume III, he refers satirically to the factors of production theory as the "holy trinity" of political economy). theoretical output prices which are equilibrium prices that would apply, if supply and demand are equal or balanced (this equilibrium could be thought of as a simple market balance, or as some kind of system equilibrium or dynamic equilibrium - where market prices gravitate towards or oscillate around some underlying value or natural price). regulating price levels of market prices for products which function as norms for trade, setting upper and lower bounds for market-price fluctuations around an axis or level according to current labour requirements for their supply. empirical price averages for products sold across a longer time-interval, obtained by averaging out actual output prices for several accounting intervals. Consequently, it remains somewhat ambiguous in what way such prices exist in reality. The conceptual challenge in modelling is to show how these three variables are related. It could, in principle, also be argued that some types of production prices are empirical price averages, while other ones only express theoretical price-levels. Obviously, if production prices are regarded only as purely "theoretical" entities, then it is not possible to claim also that they really regulate actual prices. A price level which exists only in theory, and not in reality, cannot be said to determine real price-levels (other than in the sense of publicly available price information influencing market expectations). The problem with the popular Newtonian metaphor of production prices as "centres of gravity", or alternatively the stochastic metaphor of production prices as "attractors" of market prices (both used in econophysics), is that they do not provide any causal explanation of how the "gravitation" or "attraction" process actually occurs in the real world, as a social process. The meaning of the metaphors keeps slip-sliding between empirical price-levels, theoretical price-levels and regulating price-levels. The "gravitation" could be interpreted as an actual physical process, an empirical stochastic result, or a purely theoretical description. Whatever the case, it must be explained how the gravitation process actually occurs. "Price-numbers" ultimately cannot substitute for a realistic ontology of prices and a realistic explanation of price structures. In grappling with these issues, it must also be remembered that when Marx lived there was little macro-economic statistical data available that would enable theoretical hypotheses to be tested and relativised. Marx had deduced the motions of capital essentially from an enormous amount of economic literature he read, plus available commercial and government statistics. When, towards the end of his life, he toyed with the idea of investigating economic fluctuations econometrically, Samuel Moore convinced him this was not possible, because relevant economic data and mathematical tools did not exist yet. Comprehensive macro-economic data became available only half a century later. Marx had pointed the way to solving the problems raised by the classical political economists, without however providing a complete answer. He really believed though that a "general rate of industrial profit", applying economy-wide to all industries, would be formed (at least in the sense of the minimally acceptable profit rate that is the bottom line for the average business operation) but in truth he lacked the data to prove it. He did not discuss in any detail the difference between distributed and undistributed profit, or tax requirements, and how this might affect profit statements. His discussion was limited to physical capital and labour employed, abstracting from ancillary costs and incomes unrelated to production which enterprises usually have (including tax imposts and subsidies), asset transactions, and changes in market prices. The concept of production prices is one "building block" in Marx's theory of "the tendency of differences between rates of profit on production capital to level out through competition" which aimed to tackle a theoretical problem left unsolved by David Ricardo. This problem concerned the question of explaining how an average or "normal" return on production capital invested (e.g. 8-16%) could become established, so that capitals of equal size reaped equal profits, even although the enterprises differed in capital compositions and amounts of labour performed (see labor theory of value) and consequently generated different amounts of new value. Intuitively, if the labour theory of value is true, then firms which use more labour to produce products would also create more value, and receive bigger profits. In reality, it is just the other way round: more efficient firms which use less labour to produce products receive bigger profits. According to Marx, this was not simply a logical problem, a social accounting problem or theoretical problem, but a structural contradiction intrinsic to the capitalist mode of production, which had to be continually mediated. The fact that more or less value could be appropriated by investors from the labour-efforts of the workers employed, and thus that different labour efforts were unequally rewarded, was in his eyes central to the competitive process - in which the norms of labour effort continually clashed with the norms of profitability. On the surface, it looked to the individual observer as if profit yields on capital determine expenditures on labour, but in aggregate, it is - according to Marx - just the other way around, since the volume of labour-time worked determined how much profit could be distributed among producing capitalists, via the sales of their products. The mass of surplus labour performed in the sphere of production set a limit for the mass of surplus value that could be distributed as profit in the sphere of circulation. In some interpretations of the Marxian transformation problem, total "(production) prices" for output must equal total "values" by definition, and total profits must by definition equal total surplus value. However, Marx himself explicitly denied in chapter 49 of the third volume of Das Kapital that such an exact mathematical identity actually applies. As soon as synchronic and diachronic variability in labour productivity is admitted, then the two famous identities cannot be true even in theory. Subsequently, Frederick Engels emphasized in this regard that an idealization of reality is not the same thing as reality itself, in a letter to Conrad Schmidt dated March 12, 1895. At best, it is an assumption used in modelling, which is justified if - as Marx believed - the divergence between total values and total production prices is quantitatively not very great, because actual labour expenditures and market competition constrain their divergence. But all this has never bothered neo-classical scholars such as Paul Samuelson in their interpretation of what Marx tried to do. Logically, the only way Marx has to express an identity of aggregated output prices and aggregated output values, is to say that both of the totals are equal to exactly the same quantity of abstract labour time, or a quantity of gold. But this equivalence is only asserted "by definition." In the real world, there exist no causal forces that could guarantee such an exact match. Moreover, the identity cannot be empirically proved in any direct way, since to find the quantitative relationship between labour-time and value, a relationship between labour-time and money must already be assumed. The "accounting" interpretation of production prices (value/price identity at the macro-level) by economists, according to which price distributions and value distributions can be inferred from each other, would suggest that the production price is empirically obtained from a straightforward statistical averaging of aggregated cost prices and profits. In that case, the production price is a theoretical midpoint which fluctuating actual prices would match exactly only by exception. In another interpretation, however, the production price reflects only an empirical output price-level which dominates in the market for that output (a "norm" applying to a branch of production or economic sector, which producers cannot escape from). That is, the prevailing value proportions and necessary labour requirements set a range or band within which product-prices will move. In practice, that means simply that there exists a minimum sale price at which a commodity can be viably and profitably produced; if it is not possible to sell a product at that price, it is unlikely that it will be produced at all. Borrowing an idea from Michio Morishima, Anwar Shaikh modelled the formation and change of production prices mathematically using iterative methods to show a convergence of prices and values. The iterative method was first used by George Charasoff in 1910, and subsequently developed by Japanese economists such as Kei Shibata and Nobuo Okishio. Subsequently, Anwar Shaikh concretized the concept of the production price as the "regulating price" dominating the market for a type of product, using the notion of "regulating capitals". "...if you assume that each commodity has a unique price of production and that, when all commodities are sold and bought at these prices, the rate of profit is uniform across the whole economy, then this rate of profit (in money terms) turns out in general to be different from r (the global rate of profit in value terms). Alternatively, you can ‘force’ the uniform rate of profit in the equations to be equal to r, but then the price-profit equations do not balance: you get one ‘price of production’ for a given type of commodity when it is bought as input, and a different ‘price of production’ for the very same type of commodity when it is sold as output. In my opinion, this makes the notion of price of production quite arbitrary and devoid of explanatory power." Supporters of the Temporal Single System Interpretation, such as Andrew Kliman, believe that Machover's inequality does not really arise, since, if Marx is read correctly, there is no necessity for the value of total inputs to be equal to the value of total outputs, or for inputs and outputs to be valued simultaneously. It is certainly true that transactions can be "simultaneous": buyer and seller can get their money or goods at the same time. But the same is not true for production. You cannot produce an output before you have got an input, and once you have bought an input, it takes time to produce an output, which becomes an input to the next cycle of production. The new output is not reducible to the sum of inputs, because it is a new use-value to which new value has been added by living labor. Once the output has been produced and sold, a production price (or a unit cost price) can be fixed "after the fact", but that price is based on the preceding capital outlays which are fixed once the output has been produced, plus a profit mark-up, and usually cannot change later (at least not very significantly, in the ordinary situation). That aside, in practice it is not really true that every commodity has a uniquely formed production price, as Machover suggests. At best one could say that a particular type of commodity (for example, a good quality vacuum cleaner) exhibits a normal, average production price. The production price usually applies to the capital value of the whole new output being sold, on which a profit rate is calculated. The profit or surplus value component of an individual commodity is rarely in equal proportion to the total profit on the total turnover of that type of commodity. If, for example, the total gross profit mark-up in the unit-cost structure of a packet of butter at the point of sale to the consumer is (say) 45%, that does not mean that the profit rate on the total production capital of the butter producer equals 45%. The butter producer would need to produce and sell a gigantic amount of butter in a very short time, to obtain such a high profit rate on his output. McKinsey analysts found that for every $1.00 of operating profit on consumer goods sold in the US in 2008, retailers collected a profit of about $0.31 (down from $0.60 in 1999) while the suppliers, packagers, and others along the value chain behind retail received $0.69. To obtain the same profit as before, fewer retail outlets have to sell many more products, in a shorter time-span. This can lead among other things to the phenomenon of food deserts. These readings of Marx imply that traditional interpretations of the transformation problem are really rather meaningless; the apparent mathematical wizardry is based on false interpretations of the concepts involved, and the reciprocal effects of individual actions and aggregate social outcomes is overlooked. Mathematical equations cannot substitute for conceptual precision in the definition of measuring units; they can only reveal the logical and quantitative implications of concepts and measurement units. At the beginning of Capital, Volume III, Marx provides a clue to how he thinks the "transformation problem" is solved in reality. He implies that it can be solved only by examining capital and profit distributions as a dynamic process, rather than statically. His argument is, that what industrial competition really revolves around, is principally the difference between the value of the new commodities produced, and their cost-prices, i.e. the potential surplus-value (the trading gain) which can be realized from them. There are constant disparities in space and time between labour-expenditures and capital returns, but also just as constant attempts to overcome or take advantage of those disparities. Thus, unrestricted economic competition has the result that the law of value regulates the trade in newly produced commodities: the ultimate limits of what products will trade for, i.e. their supply price, are set by comparative costs in labour-time. a uniform rate of profit and a uniform rate of surplus value for all industries do not exist, except in the sense of a minimum acceptable rate of profit or a baseline productivity level (below which an enterprise is likely to go out of business, since it cannot better its capital costs). The agents of capital do not aim simply to reach the average rate of profit, but an above-average rate of profit (the maximum profit, or a "surplus profit"). The rate of surplus value and the turnover time can vary among different producers, and across production periods. The migration of labor and capital may be restricted by technical, legal or political factors. Competition is not a "level playing field", but a process in which unequally positioned capitalists try to obtain or maintain extra profits, including the blocking of competitors in various ways to improve their own market position. This process can be fairly benign and legal, but can also become vicious and criminal, and lead to outright war. the relationship between product-values and product-prices is expressible mathematically only in probabilistic (stochastic) terms, not as a neat-and-tidy simultaneous equation based on accounting identities. total capital consumed diverges from total capital advanced, and total capital advanced is larger than total physical production capital, just as the gross business income after costs is typically greater than the profit component of the new value added. since the production price refers only to the cost prices and profit yields for newly produced outputs, the current production price can be definitely calculated only after (or on the assumption that) the newly produced output is sold, and when the total turnover is known. When Marx created a simplified, abstract model of profit distributions, he was not primarily trying to prove that the two famous identities (total profit=total surplus value, and total product value=total production price) are compatible with price-value divergences and with profit distributions according to capital employed (to the contrary: for analytical purposes, Marx assumes that they are compatible). Instead, he was trying to model the basic parameters of business competition for a share of the new surplus-value from the products produced by the working class. By identifying what the business competition is ultimately about, Marx was able to explain both what really motivates the business owners, and why the surface appearance of the business process perceived by an individual is almost the exact inverse of the real economic process in society as a whole. Much criticism of Marx's concept originates from the ambiguities referred to earlier. Consequently, many of the criticisms can, according to some Marxists, be dispelled simply by a more exact definition of the cost, product and revenue aggregates used, and of the timing of transactions (see e.g. Temporal Single System Interpretation). In doing so, it must be admitted though that Marx's draft manuscript often shows sloppy use of terminology and concepts, and that Marx's purpose was often not fully explicit. At a high level of abstraction, he moves very easily and cavalierly from values to prices and back again, and restricts his discussion of "capital invested" to intermediate goods, fixed capital and labour power only. Sometimes the transformation is portrayed as being only a quantitative change, but sometimes also as a qualitative change. Sometimes he suggests the transformation is a change from one form of value to another, at other times that there is a transition from value-form to price form. Sometimes the suggestion is, that a price category fully replaces a value category, at other times both categories always co-exist, and require each other, so that production prices can adjust to product-values but product-values can also adjust to production prices. Sometimes the transformation from value to production price is presented as a logical development, at other times the production price is presented as an irrational expression. Sometimes the production price is presented as an observable category, and at other times as a hidden regulator of market prices. Sometimes the transformation is presented as an historical process, at other times as a logical process, or as a conceptual (or epistemic) transition. Sometimes the sum total of production prices is equated with the sum total of product-values, while at other times it is asserted or implied that these cannot be equal. It never becomes quite clear how exactly these different ideas can all be easily reconciled, which makes it difficult for academics to understand the intention of Marx's theory. Quite likely Marx would have ironed out inconsistencies if he had prepared his own draft for publication, but he did not do so, leaving his readers with important issues of interpretation. In Marx's view, a capitalist production process was a valorisation process in which new value was formed. The theoretical problem was, that this value-forming process - the process vital for capital accumulation - took place mainly external to the market, being bracketed by the transactions M-C (purchase of inputs, C, using money, M) and C'-M' (sales of new output, C', for more money, M'). Between the successive exchanges, however, economic value was conserved, transferred and added to. Management then tried to estimate the cost and profit implications of different tasks and activities in production for the growth of capital, without full certainty of results. But in that case, the domains of product-values and product-prices, and consequently the domains of value relations and price relations, were separate but co-existing and overlapping domains (unless one is willing to argue that goods have an economic value only at the point where they are being sold for a price). "Price management" was not really possible insofar as prices were determined by markets which individual producers could not control, but value-based management was possible. Goods could sell below or above their real or socially average value, and that was precisely the critical problem for capitalists, because it affected their gross income and profit margins. The Marxian product-values might be of no interest whatever to capitalists, but the prevailing cost structures and price-levels in their markets certainly are. The wealth of capitalist society might present itself as "a mass of commodities" (as Marx himself put it), but before and after the commodities were sold, they existed outside the market as use values. At that point, they had only a value and a use-value, but not an actual market price (though obviously one could estimate an hypothetical selling price - see also real prices and ideal prices). Thus, at the point of production, the "factors of production" themselves had no actual market price either, only a value, because they were being used to create new products, rather than being offered for sale (indeed, what a particular business enterprise was currently "worth" in total, as a going concern, might be very difficult to say; it would depend on how much profit income it was expected to yield in the future compared to the capital assets invested in it, but even if a total price could be estimated, its individual assets might change in value continuously). A quantity of value was produced by enterprises, but how much of that value would actually be realised by an enterprise as income from sales, or how gross revenues would be distributed among producers, could not be established with certainty in advance. Yet, the value of the total masses of output-values actually produced by all enterprises affected the market prices that could be obtained by each in distribution; it affected how the market would reward each of the producers, and there was a real, systematic relationship between total value produced and total sales revenue (even although these might not be equal). More importantly, producers were constantly adjusting their commercial behaviour to the emerging economic reality (the "state of the market"), as far as they could. And that adjustment followed a specific pattern; Marx argued it created a specific trajectory for capitalist development, guided by the quest for realizing extra surplus value. There is, he argues, a permanent imperative to increase productivity, and producers aim to utilize every possibility for gaining competitive advantage (which includes blocking competition from others in some way). "The main idea is to improve our economic value-added (EVA) every year so our return of capital is more than our cost of capital." "The guiding principle of value creation is that companies create value by using capital they raise from investors to generate future cash flows at rates of return exceeding the cost of capital (the rate investors require as payment). The faster companies can increase their revenues and deploy more capital at attractive rates of return, the more value they create. The combination of growth and return on invested capital (ROIC) relative to its cost is what drives value." .In that case, it is impossible for the sum of input values to be exactly equal to the sum of output values. Indeed, that is exactly what, according to Marx, capitalists are in business for: to invest a sum of capital in production in order to get a larger sum of capital out of it. In bourgeois theories, value appears spontaneously out of trading activity in the sphere of circulation. The more the market expands and the more buying and selling there is, the more value there is, on this view. For Marx, it is in reality exactly the other way around: the more value workers create for their company, the faster companies can increase their revenues and deploy more capital at attractive rates of return. Marx regarded the prices of production as the "outward expression" of the results of a valorisation process in production, and in order to be able to talk about price aggregates at all, he thought reference to value relations was completely unavoidable. Not only was a value-theoretic principle required simply to group prices, relate them and aggregate them (meaning principles of value equivalence, comparable value, value transfer, value conservation, value creation and value used up or destroyed), but most of the stock of labour-products in an economy at any time had no actual price, simply because they weren't being traded. To what extent their value could be realised through exchange in the future could be known definitely only "after the fact", i.e. after they were actually sold and paid for. In the meantime, one could only hypothesize about their price, working from previous data. But in the final analysis, the attribution of value to products implied a social relation, without which value relations could not be understood. A community of independent private producers expressed their co-existence and mutual adjustment through the trading prices of their products; how they were socially related was expressed through the forms of value. The concept of "average profit" (a general profit rate) suggested that a process of competition and market-balancing had already established a uniform (or ruling average, or normal) profit rate previously; yet, paradoxically, what profit volumes would be (and consequently profit rates) could be established only after sales, by deducting costs from gross revenues. An output was produced before it was definitively valued in markets, yet the quantity of value produced affected the total price for which it was sold, and there was a sort of "working knowledge" of normal returns on capital. This was a dynamic business reality Marx sought to model in a simple way. Marx's critics interpreting his models often argue he keeps assuming what he needs to explain, because rather than really "transforming values into prices" by some quantitative mapping procedure, such that prices are truly deduced from labour-values, he either (1) equates value quantities and price quantities, or else (2) he combines both value quantities and price quantities in one equation. Somewhat confusingly, the cost price refers at one point to the capital advanced (input), and at another point to a component of the value of the new product (output). Thus, for example, either Marx infers a rate of profit from a given capital composition and a given quantity of surplus-value, or else he assumes a rate of profit in order to find the amount of surplus-value applying to a given quantity of capital invested. That might be fine if the aim is to just investigate what profit an enterprise or sector would receive on average, having produced a certain output value with a certain capital composition. But this manoeuvre of itself cannot contain any formal proof of a necessary quantitative relationship between values and prices, nor a formal proof that capitals of the same size but different compositions (and consequently different expenditures of labour-time) must obtain the same rate of profit. It remains only a theory. a price level must be assumed, rather than be deduced from labour-values. Beyond paradoxes, stuff just does not add up, unless more assumptions are introduced into Marx's examples, raising the question of which assumptions are legitimate to make, and whether they can solve anything without creating further inconsistencies. All the conceptual and logical issues described in the above become crucial when attempts are made to model value and price aggregates mathematically to study capitalist competition. Different kinds of theoretical assumptions or interpretations will obviously lead to very different results. In general, many modern Marxists nowadays think that Marx's idea of "transformation" was badly misinterpreted. It does not refer to a "mathematical conversion of values into prices". After all, constantly shifting product-values and product-prices co-exist side by side all the time according to Marx's theory, and operate in tandem. Rather, the transformation means that the direct regulation of the exchange of commodities according to their value is, in a capitalist mode of production, transformed into the regulation of the exchange of commodities by their production prices - reflecting the fact, that the supply of commodities in capitalist society has become conditional on the accumulation of capital, and therefore on profit margins and profit rates, within the framework of market competition. Nevertheless, Marx argues that production prices are still determined by underlying product-values (i.e. the average labour requirements for their supply). There is no logical proof available for that argument, only an empirical proof, insofar as there is a close correspondence between the magnitudes of producers' product prices and the magnitudes of labour-time required to produce them, across longer intervals of time (see below). If market trade consisted only of simple exchange (the exchange of things of equal value by the direct producers themselves), then balancing production effort, output and demand would be a fairly simple, straightforward matter. But in reality it is not so straightforward precisely because capitalist market trade is not simple exchange. Production effort, output and demand can be balanced in capitalism, only if sufficient profits are made and the accumulation of capital grows. In reality, products are constantly being sold above or below their value, according to what makes the best possible profit on the turnover, given market fluctuations. Whatever view one takes on the theoretical issues, no one can evade the (either simultaneous or sequential) reciprocal effects of individual business behaviour and aggregate economic outcomes. Additionally, it must also be recognised that "prices" are not all of one kind; actual market prices realised are not the same as ideal prices of various kinds, which may be extrapolated from real prices. A more serious criticism of Marx is that the theory of prices of production is still pitched at a far too abstract theoretical level to be able to explain anything like specific real price movements. That is, Marx only illustrated with examples the general results towards which the competitive process would tend to move in capitalism as a social system. He tried to establish what regulates product prices in the "simplest and purest case". He believed that if one could not do that, then one could also not explain all the variations from the pure case. He had not however provided a model for accurately predicting specific price movements. In this regard, it is interesting to study the writings of Michael Porter, in order to see how Marx's original intent relates to modern competitive business practice, and how it might be elaborated on (see further the important studies by Willi Semmler, Christian Bidard, Peter Flaschel, Anwar Shaikh, and Lefteris Tsoulfidis). Some critics conclude that because Marx fails to "transform" value magnitudes into price magnitudes in a way consistent with formal logic, he has not proved value exists, or that it influences prices; in turn, his theory of labour-exploitation must be false. But the validity of Marx's value theory or his exploitation theory may not depend on the validity of his specific transformation procedures, and Marxian scholars indeed often argue that critics mistake what he intended by them. In particular, since value relations - according to Marx - describe the proportionalities between average quantities of labour-time currently required to produce products, value proportions between products exist quite independently of prices (and irrespective of whether goods are currently priced or not). As the structure of product-values changes across time, the structure of prices is likely to change as well, but product-prices will fluctuate above or below product-values and typically respond to changing value proportions only with a certain time lag. Essentially, the advantage of distinguishing sharply between values and prices in this context is that it enables us to depict the interaction between shifts in product-values and shifts in product-prices as a dynamic process of real-world business and market behaviour, given the reality of different growth rates of supply and demand, i.e. not a study of the conditions for market balance, but a study of the actual process of market balancing occurring with a specific social framework, through successive adjustments which occur in a specific pattern. Arguably ideal prices could substitute for values in this analysis, but Marx's argument is that product-values will, ontologically speaking, really exist irrespective of corresponding product-prices, i.e. irrespective of whether product-values are actually being traded, whereas ideal prices do not really exist other than in computations; they are only an hypothetical description. The reason is that product-values refer to empirical quantities of labour-time performed, which are not hypothetical, but an inescapable physical and social reality. This type of analysis paves the way for an important new Marxian criticism of Piero Sraffa's otherwise brilliant critique of capital theory. In Sraffian theory, the value of a commodity "contains" both the average labour directly involved in making it ("direct labour") and past labour contained in the materials from which it is made ("indirect labour" or "dated labour"). After some pioneering work by various scholars in the 1960s, Luigi Pasinetti provided a methodological foundation for measuring the labour content of commodities, in this sense, which was developed further by Anwar Shaikh, Eduardo Ochoa, Ed Chilcote, Ara Khanjian and Lefteris Tsoulfidis. In Marx's developed theory, however, the value of the commodity represents the average labour currently required to make it, given the current state of the whole production complex - it is the current social valuation (the replacement cost) of that commodity. This is a synchronic valuation, not a diachronic one. This was not so clearly realized during the 20th century, because economists could not grasp how, in the course of Marx's dialectical story, the meaning of the operative concept of value itself could undergo some important changes. Because Marx's developed concept of value differs from the simplified concept of value, economists thought that Marx's theory was formally inconsistent. Some economists and computer scientists, such as Prof. Anwar Shaikh and Dr. Paul Cockshott, argue with statistical evidence that even just a "93% accurate Ricardian labour theory of value", is a better empirical predictor of prices than other theories. That is, the only real proofs of Marx theory and its applicability, beyond showing its internal logical consistency, are to be found in the evidence of experience. Whether more scholars will take up this challenge for research more comprehensively remains to be seen. Mostly, economists have preferred to build abstract mathematical models on the basis of a bunch of assumptions, rather than comprehensively investigate available empirical data for the purpose of creating an empirically-based theory about economic life. This contrasts with business managers, who have a strongly empirical theory of how business actually works, based on their daily experience of how things go in business. It is not difficult to prove a close positive correlation between the value of net output and the labour hours worked to produce it, since the payments which constitute that value, are themselves earnings which are necessarily proportional to time worked and paid for. Even if it is assumed, that gross profits are not proportional to time worked, by some margin, the total labour-cost involved in the total net output is nevertheless typically more than half of the value of the total net output or gross value added (in the US, labour compensation is nowadays around 55% of the value of total net output). The netted totals in the US National Income and Product Accounts (NIPA's) for 2015 show, that annual labour costs were about $9.7 trillion while the total operating surplus or gross profit (net of depreciation) was about $4.5 trillion. In other words, total US labour earnings are twice the size of total gross profit receipts directly generated by production. Since total wage costs are based on time-wages, it is simple math to understand that any measure of the net value added (gross labour compensation + gross profits) which Marx called the value product must necessarily show a strong positive correlation with the total labour hours worked. What is statistically much more difficult to prove, is the relationship between prices and values in the actual distribution of net output (a traditional example mentioned, is that while in South Korea workers on average work the most working hours in the world, per capita per year, Korean value-added per capita has been much lower than might be expected; it is not so easy to explain, why this is the case). "Mark up, normal cost, and target rate of return pricing procedures are used by pricing administrators to establish prices which will cover costs, hopefully produce a profit, and, most importantly, permit the enterprise to engage in sequential acts of production and transactions." However, a sharp distinction must be drawn between Marx's own theory and subsequent Marxist or Sraffian theories. As Lee emphasizes, "the typical statement made by Sraffians and Marxists that prices equal their costs of production (which includes a uniform rate of profit) in long-period positions has no conceptual correspondence to the concepts of costs and prices used by business enterprises." Consequently, the Marxist and Sraffian theories are not grounded in the real world of business operations, because Marxists and Sraffians confuse a purely abstract model with empirical reality. Fred Lee admits that the magnitude and the relative stability of the profit mark-up for products in modern capitalism "remains theoretically underexplained in Post Keynesian theory"
One possible solution to the "transformation problem", largely ignored in the literature, is that Marx tried to sketch a redistribution of value in too simplistic terms, considering the profitability of different production capitals in abstraction from the total circuit of capital. The problem that Ricardo failed to solve, was one of how capitals of equal sizes could empirically attract very similar profits, despite empirically manifest unequal expenditures of labour-time. But that problem may be solved more credibly, if we properly consider competition in the sphere of capital finance, i.e. the sphere of credit. In this sense, David Harvey for example mentions that "the growing power of the credit system in relation to industry also tends to force an equalization of the rate of profit (the connection between profit of enterprise and the interest rate is now very strong)." Andrea Salanti stated in 1985 that there is an "urgent need" of "reconsidering the whole methodological foundations of the theory of prices of production". In his major 2016 treatise on the economics of capitalist production, Anwar Shaikh has indeed overhauled the whole theory of prices of production in the light of empirical evidence, arguing that production prices in the classical sense can only be theoretical notions, which strictly speaking do not exist in reality. What does exist in real capitalist competition are a type of regulating prices, the dynamics of which he explicates in detail. Shaikh agrees with Keynes and with businesspeople, that what matters financially in business, is the relationship between the real rate of interest on capital and the real rate of profit on capital (at the micro level of individual firms and at the macro-level of aggregated business results). According to statistical calculations by Shaikh and Tsoulfidis, the discrepancies between the different empirical measures of product-values, prices of production, regulating prices and market prices which are feasible (using input-output data, labour data and capital stock data) turn out to be, on the whole, not very large. This suggests that the enormously long Marxist debate about the relationship between product-values and product-prices was, in a sense, unwarranted; overall, the differences between average product-prices and the underlying product-values are, as far as can be established, just not very great. And if the price/value differences are not very great, then Marx was quite justified in mostly disregarding them in Capital, Volume I and Capital, Volume II. Had Marxists been able to measure price-value relationships of products empirically, earlier on in the controversy, they might not have given the issue so much weight; but the econometric techniques to do it were perfected only from the 1980s onward. However, the validity of econometric techniques to measure price-value deviations are still in dispute. Shaikh largely side-steps a more precise conceptual discussion of the relationship between Marxian "values" and the forms of prices as such, preferring to demonstrate a strong positive correlation between movements in labour requirements and movements in actual price-levels for outputs. His analysis suggests, that the real dynamics of capitalist competition in the sphere of production are indeed remarkably similar to how Smith, Ricardo and then Marx originally described them, even although Marx's theory must be elaborated and modified to complete the classical theory, so that it is fully consistent and can properly explain the economic facts. ^ “The rates of profit prevailing in the different branches of production are… originally very different. These different rates of profit are balanced out by competition to give a general rate of profit which is the average of all these different rates. The profit that falls to a capital of given size according to this general rate of profit, whatever its organic composition might be, we call the average profit. That price of a commodity which is equal to its cost price, plus the part of the annual average profit on the capital applied in its production (not simply the capital consumed in its production) that falls to its share according to its conditions of turnover, is its price of production.” – Karl Marx, Capital, Volume III, Penguin 1981, pp. 257-258. ^ Ronald L. Meek, Studies in the Labour Theory of Value. New York: Monthly Review Press, 1975, 2nd. edition, pp. 199-200. "We call it the price of production because in the long term it is the condition of supply, the condition for the reproduction of commodities, in each particular sphere of production." - Karl Marx, Capital, Volume III, Penguin 1981, p. 300. ^ Karl Marx, Capital, Volume III, Penguin 1981, p. 1000. ^ In Theories of Surplus Value Marx used the term "cost-prices" to refer to what he later called prices of production. M.C. Howard & J. E. King, The political economy of Marx. Harlow: Longman Group Ltd, 1975, p. 233 note 39. ^ Karl Marx, Grundrisse. Penguin edition, 1973, p. 313-318, 761; Karl Marx, Theories of Surplus Value (3 Vols., see subject index). Moscow: Progress Publishers, 1978 (alternatively, Marx Engels Collected Works, Vols. 30, 31, 32, 33); Karl Marx, Capital, Volume I, Penguin 1976, p. 269 and p. 963 (the Resultate manuscript included as appendix in the Penguin edition, written somewhere between 1863 and 1866 - see also Marx Engels Collected Works Vol. 34); Karl Marx & Friedrich Engels, Letters on Capital. London: New Park, 1983, pp. 74-78  and 134-138.; Karl Marx, Capital, Volume II, Penguin 1978, p. 294, 413. ^ Karl Marx, Capital, Volume III, Penguin 1981, chapter 1, p. 117. ^ Karl Marx, Capital, Volume III, Penguin edition 1981, p. 117. ^ Allen Oakley, The making of Marx's critical theory; a bibliographical analysis. London: Routledge & Kegan Paul, 1983, chapter 5 and 6. ^ The original manuscript for Capital Vol. 3 is now available in English: Fred Moseley, Marx’s Economic Manuscript of 1864–1865 (transl. Ben Fowkes). Leiden: Brill Publishers, 2016. Overall, the differences between the original text and Engels's version are not very great, because, by his own admission, Engels aimed to provide a fairly literal rendering of the manuscript - with a few exceptions, Engels did not attempt to alter the text, solve problems of content, or introduce new content. The theoretical problems or unclarities remaining in Marx's draft were therefore not removed by Engels' editing, but reproduced fairly literally. ^ Michael Heinrich, "Engels’ Edition of the Third Volume of Capital and Marx’s Original Manuscript". Science & Society, Vol. 60. No. 4, Winter 1996-1997, pp. 452-466. ^ For an historical discussion, see Ronald L. Meek, Studies in the labour theory of value. New York: Monthly Review Press, 1975. ^ Peter Flaschel and Willi Semmler, "The dynamic equalization of profit rates for input-output models with fixed capital", in: Willi Semmler (ed. ), Competition, stability and non-linear cycles. Berlin: Springer Verlag, 1986, pp. 1-34. ^ Robert S. Lopez "The Trade of Medieval Europe", in: Cambridge Economic History of Europe, 2nd edition , Cambridge University Press, 1987, p. 375-376. ^ Maxine Berg, "Political economy and the principles of manufacture 1700-1800", in: Maxine Berg et al. (eds. ), Manufacture in town and country before the factory. Cambridge University Press, 1983, pp. 33-58. In the 19th century, Marx noted, "Institutions emerge whereby each individual can acquire information about the activity of all others and attempt to adjust his own accordingly, e.g. lists of current prices, interconnections between those active in commerce through the mails, telegraphs, etc. (the means of communication of course grow at the same time). (This means that, although the total supply and demand are independent of the actions of each individual, each one attempts to inform himself about them, and this knowledge then reacts back in practice on the total supply and demand... (The possibility of general statistics, etc.)". - Karl Marx, Grundrisse, Penguin 1973, p. 161. ^ An in-depth discussion is provided in Anwar Shaikh, Capitalism. Oxford University Press, 2016, chapter 9. ^ Karl Marx, Capital, Volume III, Penguin edition 1981, pp. 277, 280-281, 774, 985, and 1020. ^ "The prices that arise when the average of the different rates of profit is drawn from the different spheres of production, and this average is added to the cost prices of these different spheres of production, are the prices of production. Their prerequisite is the existence of a general rate of profit, and this presupposes in turn that the profit rates in each particular sphere of production, taken by itself, are already reduced to their average rates." - Karl Marx, Capital, Volume III, Penguin 1981, p. 257. ^ Karl Marx, Theories of surplus value. Moscow: Progress Publishers, 1971, Part III, p. 83. ^ Michael Heinrich, Introduction to the three volumes of Marx's Capital, p. 167. ^ See the Fortune Magazine 500 or the Forbes 500, or see Andrew D. Goldberg et al., Guide to the markets 2015 Q1. New York: J.P. Morgan Asset Management, 2015. ^ Ernest Mandel, Late Capitalism. London: NLB, 1975, chapter 3. ^ "...what we call price of production is in fact the same thing that Adam Smith calls 'natural price', Ricardo 'price of production' or 'cost of production' and the Physiocrats prix necessaire, though none of these people explained the difference between price of production and value. We call it the price of production because in the long term it is the condition of supply, the condition for the reproduction of commodities, in each particular sphere of production." - Karl Marx, Capital, Volume III, Penguin 1981, p. 300. ^ For example, "The price of production is regulated in each sphere, and regulated too according to particular circumstances. But it is... the centre around which the daily market prices revolve, and at which they are balanced out in definite periods" - Karl Marx, Capital, Volume III, Penguin 1981, p. 280. ^ Karl Marx, Capital, Volume I, Penguin 1976, p. 269, p. 675, p. 678-679. ^ "What is called the natural rate of interest simply means the rate established by free competition. There are no ' natural ' limits to the interest rate." Karl Marx, Capital, Volume III, Penguin 1981, p. 478. ^ Peter M. Lichtenstein, An introduction to post-Keynesian and Marxian theories of value and price. London: Routledge, 1983, reprinted 2017. ^ Karl Marx, Capital, Volume III, Penguin 1981, p. 781. ^ Karl Marx, Capital, Volume III, Penguin 1981, p. 892. ^ Marx, Capital, Volume III, Penguin 1981, p. 399. ^ Karl Marx, Capital, Volume III, Penguin 1981, p. 779. Cf. Abelardo Mariña-Flores, "Market Price of Production: A Structural Interpretation of Disequilibrium in the Framework of the Law of Value". International Journal of Political Economy, Vol. 28, No. 4, Winter, 1998/1999, pp. 82-118. ^ Russell Hensley et al., The future of the North American automotive supplier industry: evolution of component costs, penetration, and value creation potential through 2020. Washington: McKinsey & Company, March 2012. ^ David Harvey, The Limits to Capital. London: Verso, 2006, p. 181. ^ Karl Marx, Capital, Volume III, Penguin 1981, p. 895. ^ "Business cycle theorists, growth theory specialists, industrial organization experts, and other orthodox economists have often drawn on Marx’s writings in the development of their work. Perhaps one of the best known examples is that of Wassily Leontief, the father of the modern techniques of input/output analysis that are the basis of many contemporary capitalist planning models. The roots of his ideas, as he is quick to recognize, come partly from Marx’s reproduction schemes in Volume II of Capital." - Harry Cleaver, Reading Capital politically, Antitheses/AK press, 2000, p. 28. ^ Karl Marx, Capital, Volume III, Penguin ed., p. 953f. ^ Anwar Shaikh, Capitalism. Oxford University Press, 2016, pp. 364-367. ^ Anwar Shaikh, Capitalism. Oxford University Press, 2016, chapter 9. ^ An average price or value can for example refer to a specific point in time, a specific time interval, or a group of assets under specified conditions. ^ "The price of production is regulated in each sphere, and regulated too according to particular circumstances. But it is... the centre around which the daily market prices revolve, and at which they are balanced out in definite periods" - Karl Marx, Capital, Volume III, Penguin 1981, p. 280. ^ Karl Marx, Capital, Volume III, Penguin 1981, pp. 279, 303-304, 786, 1000. ^ Karl Marx, Capital, Volume III, Penguin 1981, p. 273. ^ Karl Marx, Capital, Volume III, Penguin 1981, p. 489. ^ Thomas Piketty, Capital in the twenty-first century. Harvard: Belknap Press, 2014, p. 230. ^ Zoltan Kenessey, "Why Das Kapital remained unfinished". In: William Barber (ed. ), Themes in pre-classical, classical and Marxian economics. Aldershot: Edward Elgar, 1991, pp. 119-133. ^ Letter of Karl Marx to Friedrich Engels, dated May 31, 1873. "I have been telling [Samuel] Moore about a problem with which I have been racking my brains for some time now. However, he thinks it is insoluble, at least pro tempore, because of the many factors involved, factors which for the most part have yet to be discovered. The problem is this: you know about those graphs in which the movements of prices, discount rates, etc. etc., over the year, etc., are shown in rising and falling zigzags. I have variously attempted to analyze crises by calculating these ups and downs as irregular curves and I believed (and still believe it would be possible if the material were sufficiently studied) that I might be able to determine mathematically the principal laws governing crises. As I said, Moore thinks it cannot be done at present and I have resolved to give it up for the time being". Marx, "Letter to Engels, 31 May 1873". Marx-Engels Werke Vol. 33, p. 821. Marx Engels Collected Works, Vol. 44, p. 504. ^ Paul Studenski, The income of nations: theory, measurement and analysis, past and present. Washington Square: New York University Press, 1958. ^ Karl Marx, Capital, Volume III, Penguin 1981, pp. 971-972. 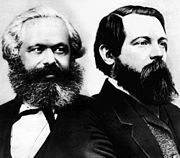 ^ Karl Marx & Friedrich Engels, Letters on Capital. London: New Park, 1983, pp. 286-298. ^ P.A. Samuelson,"Wages and interest: a modern dissection of Marxian economic models," American Economic Review, Vol. 47, 1957, pp.884-912; P.A. Samuelson, “Understanding the Marxian Notion of Exploitation: A Summary of the So-Called Transformation Problem Between Marxian Values and Competitive Prices,” in: Journal of Economic Literature, Vol. 9 no. 2, 1971, pp. 399–431; P.A. Samuelson, "The 'transformation' from Marxian 'value' to competitive 'prices': a process of rejection and replacement," Proceedings of the National Academy of Sciences, Vol. 67, no. 1, 1970, pp. 423-425; P.A. Samuelson, "Insight and detour in the theory of exploitation: a reply to Baumol," Journal of Economic Literature, Vol. 12, no. 1, 1974, pp.62-70; P.A. Samuelson, "Rejoinder: Merlin unclothed, a final word." Journal of Economic Literature, Vol. 12 no. 1, 1974, pp.75-77. ^ Lefteris Tsoulfidis & Persefoni Tsaliki, "Marxian Theory of Competition and the Concept of Regulating Capital: evidence from Greek manufacturing", in: Review of Radical Political Economics, Vol. 37, No. 1, 2005, pp. 5-22; Lefteris Tsoulfidis & Persefoni Tsaliki, “Classical Competition and Regulating Capital: Theory and Empirical Evidence”. In: J. Moudud et al., Alternative Theories of Competition: Challenges to Orthodoxy. Routledge, 2012; Lefteris Tsoulfidis, “Contending Conceptions of Competition and the Role of Regulating Capital”. Panoeconomicus, Vol 62, No. 1, 2015, pp. 15-31. ^ Michio Morishima, Marx’s Economics. Oxford University Press, 1973. Michio Morishima and George Catephores, “The transformation problem: a Markov process”. In Morishima (ed. ), Value, Exploitation and Growth – Marx in the Light of Modern Economic Theory. New York: McGraw-Hill, 1975. ^ Anwar Shaikh, "Marx's theory of value and the 'transformation problem'", in Jesse Schwartz (ed), The Subtle Anatomy of Capitalism. Goodyear Publishing Company, 1977. ^ Anwar Shaikh, "Notes on the Marxian notion of competition." Unpublished paper, New School of Social Research, 1979. Anwar Shaikh, Capitalism. Oxford University Press, 2016, pp. 221, 380, 400f. ^ Moshé Machover, "Value, prices and probabilities." Weekly Worker 906, 22 March 2012. ^ Manyika, James; Chui, Michael; Bughin, Jaques; Brown, Brad; Dobbs, Richard; Roxburgh, Charles; Byers, Angela Hung (May 2011). "Big Data: The next frontier for innovation, competition, and productivity". McKinsey Global Institute: 65. Retrieved March 4, 2016. ^ Emmanuel Farjoun and Moshe Machover, Laws of Chaos; A Probabilistic Approach to Political Economy. London: Verso, 1983. ^ Ernest Mandel, Late Capitalism. London: New Left Books, 1975. ^ Karl Marx, Capital, Volume 3, Penguin 1981, pp. 241-242, p. 275. Chapter 4 in the third volume of Marx's Capital about the impact of turnovers on profitability was added by Friedrich Engels. ^ See e.g. Ha-Joon Chang, Kicking away the ladder. London: Anthem Press, 2002. ^ Anwar Shaikh, Capitalism. Oxford University Press, 2016, Part II. ^ Paul Cockshott & Allin Cottrell, "What is at stake in the debate on value", October 21, 2005. ^ Karl Marx, Capital, Volume II. Penguin 1981, p. 263. ^ Marx, Capital, Volume III, Penguin 1981, p. 274. ^ Karl Marx, Capital, Volume III, Penguin 1981, p. 305. ^ Karl Marx, Capital, Volume III, Penguin 1981, p. 300. ^ Marx, Capital, Volume III, Penguin 1981, p. 139, 272, 311-313, 1008 etc. ^ Karl Marx, Capital, Volume III, Penguin 1981, p. 277. ^ Karl Marx, Capital, Volume III, Penguin 1981, p. 303-304. ^ Tabitha Neville, "The value creation equation", Corporate Finance Magazine, March 2004. ^ Timothy M. Koller, "Why value value? Defending against crises", McKinsey Quarterly, April 2010, excerpted from Tim Koller, Marc Goedhart, and David Wessels, Valuation: Measuring and Managing the Value of Companies, fifth edition, Hoboken, NJ: John Wiley & Sons, August 2010. ^ "The excess value or surplus-value realized with the sale of the commodity... appears to the capitalist as an excess of its sale price over its value, instead of an excess of its value over its cost price, so that the surplus-value concealed in the commodity is not simply realized by its sale, but actually derives from the sale itself." Marx, Capital, Volume III, Penguin 1981, p. 128. ^ Henryk Grossmann, "Die Wert-Preis-Transformation Problem bei Marx und das Krisenproblem". In: Zeitschrift fur Sozialforschung (Leipzig), Vol. 1, 1932. Reprinted in: Friedrich Eberle (ed. ), Aspekte der Marxsche Theorie 1: Zur methodischen Bedeutung des 3. Bandes des Kapital. Frankfurt: Suhramp Verlag, 1973, pp. 195–227. ^ W. van Drimmelen, Meerwaarde en winst. Nijmegen: Socialistische Uitgeverij Nijmegen, 1976, chapter 4. ^ Shinzaburo Koshimura, Theory of capital reproduction and accumulation. Kitchener, Ontario: DPG Publishing Co., 1975, chapter 5. Koshimura provides a very clear exposition of the topic. ^ Alan Freeman and Guglielmo Carchedi (eds. ), Marx and Non-Equilibrium Economics. Cheltenham, UK: Edward Elgar, 1996; Fred Moseley, Money and Totality. A Macro-Monetary Interpretation of Marx’s Logic in Capital and the End of the Transformation Problem. Leiden: Brill, 2016; Anwar Shaikh, Capitalism. Oxford: Oxford University Press, 2016. ^ Anwar Shaikh, Capitalism. Oxford: Oxford University Press, 2016, chapter 9. ^ Bob Rowthorn, "Wealth of Nations. Review of Michael Porter, 'The competitive advantage of nations'." Marxism Today (London), October 1990, p. S3. See also by Michael Porter, Competitive advantage and Competitive strategy. ^ Willi Semmler, Competition, Monopoly, and Differential Profit Rates; On the Relevance of the Classical and Marxian Theories of Production Prices for Modern Industrial and Corporate Pricing. Columbia University Press, 1984; Christian Bidard, Prices, Reproduction, Scarcity. Cambridge University Press, 2004; Peter Flaschel, Topics in classical micro- and macroeconomics Heidelberg: Springer, 2010; Anwar Shaikh, Capitalism. Oxford University Press, 2016; Theodore Mariolis & Lefteris Tsoulfidis, Classical Economics and Reality. A Spectral Analysis of the Theory of Value and Distribution. Tokyo: Springer, 2016. ^ Ajit Sinha, Theories of Value from Adam Smith to Piero Sraffa. London: Routledge, 2010. ^ E.g. Michio Morishima & Francis Seton, "Aggregation in Leontief matrices and the labour theory of value". Econometrica 29, 1961, pp.203-20. ^ Edward B. Chilcote, "Calculating Labour Values Empirically". In: Alan Freeman et al., The New Value Controversy and the Foundations of Economics. Cheltenham: Edward Elgar, 2004, pp. 199-217; Luigi L. Pasinetti, "The notion of vertical integration in economic analysis". Metroeconomica, Vol. 25, No. 1, February 1973, pp. 1-29; Luigi L. Pasinetti, "Growing subsystems, vertically hyper-integrated sectors and the labour theory of value" Cambridge Journal of Economics, Vol. 12 No. 1, 1988, pp. 125-134; Eduardo M. Ochoa, Labor Values and Prices of Production: an Inter-Industry Study of the U.S. Economy, 1947-1972. PhD Thesis, New School for Social Research, 1985; Eduardo Ochoa, "An input-output study of labor productivity in the US economy, 1947-72". Journal of Post-Keynesian Economics, Volume IX No. 1, Fall 1987, pp. 111-137; Alfred Eichner and Eduardo M. Ochoa, "The structure of industrial prices". Paper presented at the ASSA annual meeting, New York, 28 December 1988; Eduardo M. Ochoa, "Values, prices and wage-profit curves in the US economy". Cambridge Journal of Economics, Vol. 13, 1989, pp. 413-429; Ara Khanjian, Measuring and Comparing the Price and Value Rates of Surplus Value in the U.S., 1958-1977. Ph.D. dissertation, Department of Economics, New School for Social Research (New York), 1988. Anwar Shaikh, Capitalism - competition, conflict, crises. Oxford University Press, 2016; Theodore Mariolis & Lefteris Tsoulfidis, Classical Economics and Reality. A Spectral Analysis of the Theory of Value and Distribution. Tokyo: Springer, 2016, chapter 3. ^ Among the first scholars to state this clearly is Ian P. Wright. ^ "...the value of a commodity is determined not by the quantity of labour actually objectified in it, but by the quantity of living labour necessary to produce it." - Karl Marx, Capital, Volume I, Penguin 1976, p. 676-677. "...the value of commodities is determined not by the labour-time originally taken by their production, but rather by the labour-time that their reproduction takes, and this steadily decreases as the social productivity of labour develops." - Marx, Capital, Volume III, Penguin 1981, p. 522. ^ Ronald L. Meek, "A plain person's guide to the transformation problem". In: Ronald L. Meek, Smith, Marx and after. Ten essays in the development of economic thought. London: Chapman & Hall, 1997, pp. 95-119. ^ Ian P. Wright, "prices of production are proportional to real costs". Discussion paper no. 59, Economics Department, Faculty of Social Sciences, The Open University. Milton Keynes, January 2007; Howard Nicholas, Marx's theory of price and its modern rivals. London: Palgrave Macmillan, 2011. ^ George J. Stigler, "Ricardo and the 93% labour theory of value". The American Economic Review, Vol. 48, No. 3, June 1958, pp. 357-367. ^ E.M. Ochoa, Labor Values and Prices of Production: an Inter-Industry Study of the U.S. Economy, 1947-1972, PhD Thesis, New School for Social Research, 1985. Anwar Shaikh, "the Empirical Strength of the Labor Theory of Value". In: Riccardo Bellofiore (ed. ), Conference Proceedings of Marxian Economics: A Centenary Appraisal. London: Macmillan, 1998 "Archived copy" (PDF). Archived from the original (PDF) on 2009-10-02. Retrieved 2010-04-25. CS1 maint: Archived copy as title (link); W. Paul Cockshott papers ;Theodore Mariolis & Lefteris Tsoulfidis, Classical Economics and Reality. A Spectral Analysis of the Theory of Value and Distribution. Tokyo: Springer, 2016, chapter 3. ^ Bureau of Economic Analysis, Table 1.10: "Gross Domestic Income by Type of Income". ^ OECD statistics provide data on labour productivity levels in the total economy for many countries. See also Tim Worstall, "Korean Wages are now higher than Japanese wages, perhaps for the first time in 3,000 Years." Forbes Magazine, 14 February 2015. ^ Frederic S. Lee, Post-Keynesian Price Theory. Cambridge University Press, 1999, p. 228. ^ Frederic S. Lee, Post-Keynesian Price Theory. Cambridge University Press, 1999, p. 204 note 10. ^ J.E. King (ed. ),The Elgar Companion to Post-Keynesian Economics. Cheltenham: Edward Elgar, 2003, p. 287. ^ Andrea Salanti, "Prices of production, market prices and the analysis of the choices of techniques." ´´Metronomica´´, Vol. 37 No. 3, 1985, pp. 241-267. ^ Anwar Shaikh, Capitalism. Oxford University Press, 2016, chapter 9, at p. 438. ^ Shaikh, op. cit., pp. 413-416. Theodore Mariolis & Lefteris Tsoulfidis, Classical Economics and Reality. A Spectral Analysis of the Theory of Value and Distribution. Tokyo: Springer, 2016, chapter 3. ^ "The crosssectional variations in the calculated prices of production are entirely dominated by the corresponding variations in relative values, with between 87% and 92% of the former being explained by the latter." - Anwar Shaikh, "The Transformation from Marx to Sraffa", in: Ernest Mandel & Alan Freeman, Ricardo, Marx, Sraffa. London: Verso, 1984, pp. 43-84, at p. 73. "...measured in terms of their average absolute percentage deviations, prices of production are within 8.2 per cent of market prices, labour values are within 9.2 per cent of market prices and 4.4 per cent of prices of production, and the linear approximation is within 2 per cent of full prices of production and 8.7 per cent of market price." - Anwar Shaikh, "the Empirical Strength of the Labor Theory of Value". In: Riccardo Bellofiore (ed. ), Marxian Economics: A Reappraisal, Volume 2. New York: St Martin's Press, 1998, p. 226. ^ Wilfried Parys, "The deviation of prices from labor values". The American Economic Review, Vol. 72, No. 5, December, 1982, pp. 1208-1212; P. Petrovic, "The deviation of production prices from labour values: some methodology and empirical evidence." Cambridge Journal of Economics, Vol. 11, No. 3, September 1987, pp. 197-210; Andrew J. Kliman, "The law of value and laws of statistics: sectoral values and prices in the US economy, 1977-97". Cambridge Journal of Economics, Vol. 26 No. 3, 2002, pp. 299–311; Emilio Diaz & Ruben Osuna, "Can we trust cross-sectional price-value correlation measures? Some evidence from the case of Spain." Journal of Post Keynesian Economics. Vol. 28 No. 2, Winter 2006, pp. 345–363; Andrew Kliman, "What Is Spurious Correlation? A Reply to Díaz and Osuna.” Journal of Post-Keynesian Economics, Vol. 31 No. 2, Winter 2008–9 pp. 345–356. Emilio Díaz & Rubén Osuna, "Understanding Spurious Correlation: A Rejoinder to Kliman". Journal of Post Keynesian Economics, Vol. 31, No. 2 (Winter, 2008-2009), pp. 357-362; Emilio Díaz & Rubén Osuna, "Indeterminacy in Price–Value Correlation Measures”. Empirical Economics, Vol. 33, No. 3, November 2007, pp. 389–399; Emilio Díaz & Rubén Osuna, “From Correlation to Dispersion: Geometry of the Price–Value Deviation.” Empirical Economics, Vol. 36, No. 2, May 2009, pp. 427–440; Jonathan Nitzan & Shimshon Bichler, Capital as power. Routledge, 2009. Nils Fröhlich, "Dimensional Analysis of price-value deviations". Unpublished paper, 18 October 2010. Paul Cockshott, Allin Cottrell & Alejandro Valle Baeza, "The empirics of the labour theory of value: reply to Nitzan and Bichler". Investigación Económica, vol. LXXIII, no. 287, January-March 2014, pp. 115-134. ^ Gavin Mendel-Gleason, "Review of Capitalism: competition, conflict, crises by Anwar Shaikh".Spirit of Contradiction, 30 October 2016.;Anwar Shaikh video interview with Ingar Solty, titled "Marx and the moon", at the Brussels conference "Free Trade and the Right to (Not) Migrate", 29 Sept. - 1 Oct. 2016. Reiner Franke, "Production Prices and Dynamical Processes of the Gravitation of Market Prices". Peter Lang, 1987. Diego Guerrero, "The labour theory of value and the double transformation problem". Nómadas. Revista Crítica de Cien cias Sociales y Jurídicas. Vol. 16 No. 2, 2007. S. Hollander, Economics of Karl Marx: Analysis and Application. New York: Cambridge University Press, 2008. This page was last edited on 23 December 2018, at 02:56 (UTC).